Cruise on San Francisco Bay with glass of champagne on deck as you sample a variety of delectable dishes. End the night with a casual stroll around the deck or dance against the backdrop of one of the most breathtaking skylines in the USA! 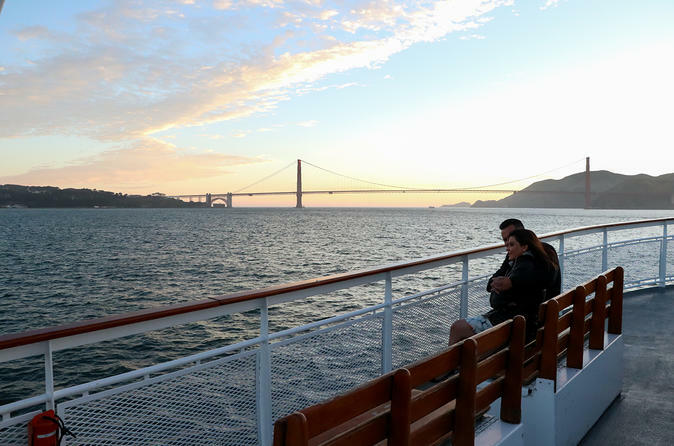 Enjoy magnificent skyline views, fine cuisine and refreshing ocean breezes aboard a supper cruise on San Francisco Bay. The arresting skyline of the "City by the Bay" includes the landmark TransAmerica Pyramid, Embarcadero Center's four "fingers", and Coit Tower on Telegraph Hill. Sail under the magnificent Golden Gate Bridge and enjoy the festive lights adorning the Bay Bridge at night. As you admire the views, sip on cocktails and indulge in distinctive dining featuring small plates and a velvety Chocolate Fountain just waiting for you to try. Dance the night away with the live DJ, or relax on the decks enjoying the fresh sea air and taking in the night views of San Francisco city. This cruise is seasonal and operates from June to October only.